A rarely seen pattern, and only known in this two-handled stemmed bonbon. Reported only in blue and marigold. The blue example shown here sold for $1,500 in 1993. 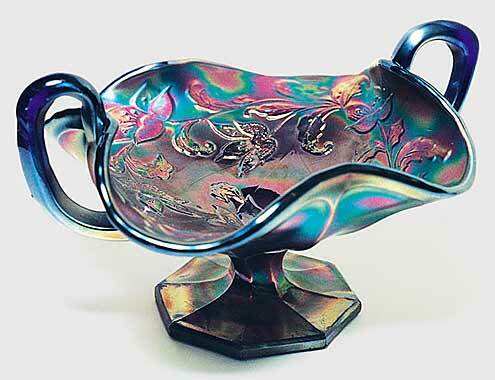 It had at one time been on loan to the Fenton Museum. A marigold piece with a hairline crack sold for $475, also in 1993. Another blue example sold in 2001 for $600. A marigold example with a crack sold for $120 in 2003 and again in 2010 for $95.